Pup Tramples through a Crime Scene and Jumps into Police Car. 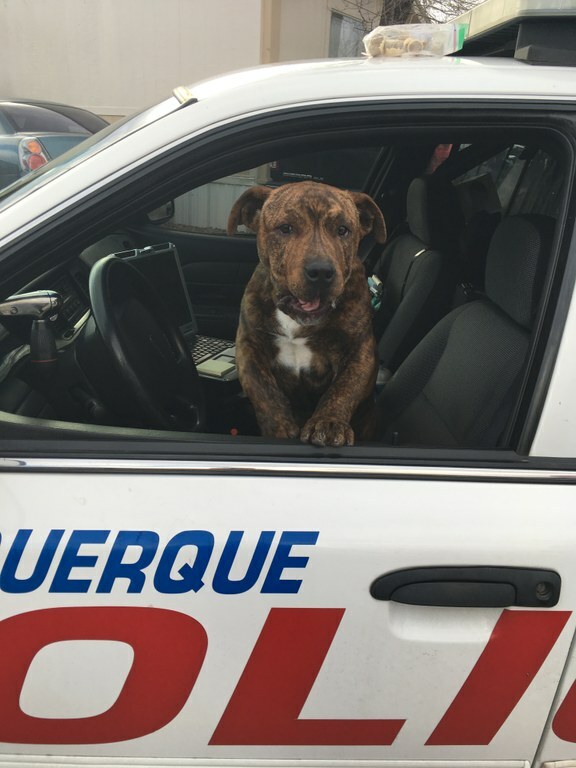 On New Year's Eve this gorgeous fellow found himself in the middle of a police investigation and decided he wanted to ride in an APD Police Car. 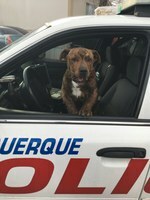 The dog, now nicknamed Gilmore, was in a neighborhood near Coors and Arenal. Officers there had just arrested a suspect who jumped out of a stolen vehicle and tried to run from them. Gilmore decided he wanted to help process evidence and jumped into the stolen vehicle to help. Obviously, officers couldn't have Gilmore leaving his prints everywhere, so they scooped him up and out of the stolen SUV. When they put him on the ground, Gilmore bolted for a an officer's patrol car and jumped right in through an open window. The officer did some investigating and drove Gilmore around trying to locate his family, but no one knew where he had come from. A family nearby said they found him on Christmas, but did not know who his owners are. Gilmore is now at the West Side Animal Shelter. If no one claims him, he will be up for adoption.